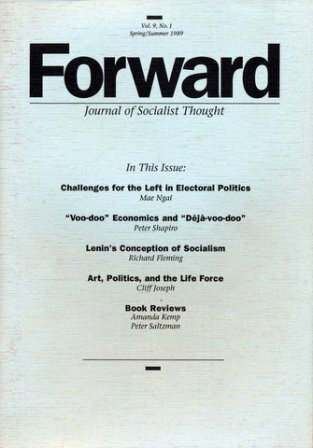 First Published: Forward, Vol. 9, No. 1, Spring/Summer 1989. Editors’ note: What is socialism? If we are socialists, what are we actually fighting for? This question, long a subject of debate on the left, is receiving even more attention today because of the momentous changes taking place in China and the Soviet Union. Many activists are being challenged by developments in these and other countries to rethink their conceptions of socialism. Part of the confusion comes from a tendency in the left to view socialism as an abstract theoretical issue. Some seek a universal set of principles that “define” socialism, a checklist which determines if a country is “really” socialist. Others say socialism is simply public ownership of the means of production, and other criteria are irrelevant. Still others argue there are no socialist countries in the world today. The problem with such approaches is their stress on finding the “right definition” somewhere in the writings of Marx, Engels or Lenin. However, Marx and Engels never provided a detailed picture, nor did Lenin before the October Revolution of 1917. And since the Russian Revolution, there has been a great variety of forms of socialism in different countries, and even in different periods in the same country. In the Soviet Union today, for example, Mikhail Gorbachev is experimenting with various approaches to questions of how socialism develops and how socialist democracy operates. He is trying to discard outmoded views and policies that have created problems for the country’s progress. The following article does not attempt a comprehensive analysis of what is socialism. Rather it aims to open a discussion. In examining Lenin’s history and writings it is clear he had no set conceptions about what socialism would look like. His views on socialism changed and developed as he gained experience with the tactics and methods of constructing it. But the thread which runs through Lenin’s writings is his view that socialism should be a society where the working people control their own fate, a society organized to benefit the vast majority. This view was the foundation for Lenin’s efforts in socialist construction. At the time of the victory of the Russian Revolution in October 1917, Lenin’s views on socialism and how to build it were limited. He held that socialism was characterized by several principal features. These were public ownership of the means of production, an end to exploitation, and the dictatorship of the proletariat. As of October 1917, Lenin had not yet translated these general points into an actual plan for socialism in Russia. This reflected not a lack of preparation on Lenin’s part, but rather his approach to political problems. Lenin was an eminently practical person. During the long years of struggle before 1917, he devoted little attention to the question of socialism because it was not yet an immediate issue. In Lenin’s words, “We must bear firmly in mind that we have never set ourselves ’insoluble’ social problems.” (“Can the Bolsheviks Retain State Power?” Sept. 1917). It was not until the revolution was nearing victory, and the problem of building the new society loomed as a practical matter, that Lenin devoted more attention to the question. He approached the issue of socialism not by looking primarily to Marx’s writings for answers, but to the actual situation in Russia. Marx offered no blueprint for socialism and had written little about Russia. And the world had changed considerably since Marx’s time, especially with the development of imperialism. Either they do not know the facts of life, do not see what actually exists and are unable to look the truth in the face, or they confine themselves to abstractly comparing ’capitalism’ with ’socialism’ and fail to study the concrete forms and stages of the transition that is taking place in our country. A creative approach was especially important, since conditions in Russia differed markedly from those Marx thought necessary for socialist revolution. Marx expected socialism to develop first in one of the highly developed capitalist countries of Western Europe, with their extensive industrial production and large urban proletariat. Russia’s population was mostly peasantry, and the industrial working class was small. Some European Marxists viewed Russia as the backward stepchild of Europe which would be one of the last countries to have a socialist revolution. But Lenin saw in Russia the potential, and desperate need, for socialism. The oppression endured by the Russian people was extreme. Peasants barely survived tilling the fields of wealthy landlords, and workers labored 14-hour days in the industrial sweatshops of Russia’s capitalists. Frequent uprisings against these conditions rocked city and countryside, and the people were open to revolutionary ideas. Lenin and the Russian Communist Party (the Bolsheviks) showed the people that the source of their oppression was capitalism, and the solution lay in socialism. But how was this new society to be achieved? The critical first step, in Lenin’s view, was taking political power, replacing the government of the capitalist class with the rule of the working people. Lenin took Marx’s views and further developed them. Marx held that under socialism the government would be a dictatorship of the proletariat. The working class, the most politically advanced class, would rule society and lead the other laboring classes – the petty bourgeoisie and the peasants – in building socialism and stopping the bourgeoisie from regaining power. But in formulating these views, Marx had Western Europe in mind. In Russia, the proletariat was small and 80% of the population were peasants. What role was this vast majority to play in the new government? Lenin held that in Russia the peasantry must be an integral part of the socialist government, because of their numbers and because the peasants, especially the poor peasants, overwhelmingly supported socialism. He explained that given Russia’s particular conditions, a dictatorship of the proletariat and poor peasantry was needed. Lenin’s conception of socialist government was an example of his creativity. Some “orthodox” Marxists of the time opposed the peasants’ participation in government, claiming it violated Marxism and would corrupt the government with the peasants’ petty bourgeois ideology. But Lenin held that these critics failed to understand Russian reality and underestimated the revolutionary sentiments of the peasantry. Their approach would narrow the government’s base of support and ensure its eventual downfall. Lenin won most of the party to his view. The new socialist government set up in Russia after the victory of the revolution was composed of mass organizations called Soviets, councils democratically elected by workers, peasants and soldiers. The Soviets arose spontaneously in 1905 during a democratic uprising, but were suppressed when that revolution failed. Soviets re-emerged in 1917 as the popular struggle intensified. Lenin described the Soviets as the institutions developed by the Russian Revolution which best represented the interests of the oppressed. He identified some of the key features of the Soviets: they were an armed force of workers and peasants; they provided an intimate bond with the people; their personnel were elected and subject to recall at any time; and they helped train and educate the oppressed, among other features. Under socialism, the government was to defend working people’s rights to a decent standard of living and a life free from exploitation. The socialist government should end the oppression of minority nationalities and women. Working people should rule society in their own interests. The new Soviet government was still organizing itself when it became clear that the issue of who controlled the state had not been resolved. The overthrown bourgeoisie and the rich landlords retained tremendous clout through control of crucial sectors of the economy. Within days of their overthrow, they began furiously organizing to regain their lost influence. Lenin pointed out that the political strength of the capitalists and large landlords would be decisively broken only by dismantling their economic power, and this was one of the Soviet government’s earliest goals. On October 26, 1917, the government decreed the abolition of private property in land to break the power of the large landowners. Over the next several months their massive estates were subdivided and the land turned over to the poor peasants. Food hoarded by the rich landlords was seized and distributed to the people. Next came the large capitalists. On January 18, 1918, all factories, mines and transport were declared government property, and over the following months many industries were nationalized. Workers’ councils were set up to oversee the factories and defend workers’ rights on the job. These initial steps helped weaken the bourgeoisie and consolidate the power of the Soviet government. By early 1918, the Soviet government’s hold on power was secure, at least temporarily. But more difficulties lay ahead. The conditions Lenin faced at that time were bleak. Russian society was in collapse. The country was devastated by years of fighting in World War I, large areas of its territory were occupied by foreign troops, domestic counterrevolutionaries were plotting the overthrow of socialism, and the economy was a shambles. Starvation and disease were commonplace. How were Lenin and the Bolsheviks to solve these problems and organize socialism? How were they to organize the economy, get agriculture and industry back on their feet, and set up new political structures? There were no easy answers. Later, Lenin was even led to say that organizing socialism was a far more difficult task than overthrowing the bourgeoisie. Accounting and control – that is the main thing needed to achieve the ’smooth working,’ the correct functioning of the first phase of communist society [socialism].... The accounting and control necessary for this have been simplified by capitalism to the extreme and reduced to the extraordinarily simple operations – which any literate person can perform – of supervising and recording, knowledge of the four rules of arithmetic, and issuing appropriate receipts. In every socialist revolution . . . the principal task of the proletariat, and of the poor peasants which it leads, is the positive or constructive work of setting up an extremely intricate and delicate system of new organizational relationships extending to the planned production and distribution of the goods required for the existence of tens of millions of people.... [It is a] difficult problem. On a series of other questions as well, Lenin’s views evolved. For example, he changed his view on the possibility of building socialism in one country. In March 1921, Lenin said at the Tenth Party Congress that the struggle for socialism in Russia could not succeed without the victory of socialism in other European countries. Two years later, in the article “Better Fewer, But Better,” Lenin said history had shown socialist revolutions were not imminent in other European countries, but this did not mean Russia could not succeed in its own socialist revolution. Other issues on which Lenin’s views evolved included whether to use money or a system of labor certificates to reward work, how extensive centralized planning should be, and whether the overthrown bourgeoisie should be allowed to vote, to name a few. No one, I think, in studying the question of the economic system of Russia, had denied its transitional character. Nor, I think, has any Communist denied that the term Socialist Soviet Republic implies the determination of Soviet power to achieve the transition to socialism, and not that the new economic system is recognized as a socialist order. In the same article, Lenin pointed out that even state capitalism would be a step forward compared to the primitive level of production prevailing in Russia. Immediate emphasis had to be given to modernizing and developing the economy. In the summer of 1918, a major development forced radical alterations in Lenin’s plans for socialist development. In June, a group of imperialist countries, fearful the Soviet revolution might inspire revolt in their own lands, invaded Russia to restore the bourgeois order. Thousands of French, British, U.S. and Japanese troops attacked from east and west, occupying large areas of Russian territory. The imperialist countries also sponsored uprisings by Russian counterrevolutionaries to try to topple the Soviet government. This assault by four of the world’s strongest countries profoundly affected socialism in Russia. All plans for economic development had to be adjusted, and most of Russia’s resources and efforts for the next two-and-a-half years were devoted to the war. At the time of the invasion, Russia was poorly equipped to defend itself. Industry and agriculture had still not recovered from the devastation of World War I. The imperialist troops scored some initial successes and within a matter of months were advancing on Russia’s major urban centers. A severe crisis loomed, leading Lenin and the Soviet government to adopt a series of drastic policies called “war communism.” “War communism” profoundly affected all aspects of society. Food was desperately needed, and Lenin said that all food over a set amount for each peasant must be turned over to the government for distribution to the cities and the army. This policy of “surplus appropriation” did not accord with the classical Marxist principle of distribution under socialism. Marx had said that during socialism, every person would be rewarded according to the amount of work he or she performed. The more work a person did, the more of society’s goods he or she would receive. Under “surplus appropriation,” no matter how much a peasant worked, he or she still received only a fixed amount of food. Lenin knew this system could not be sustained indefinitely. It would eventually sap morale and undermine the peasants’ enthusiasm for production. But he saw the measure as critical to obtain the vast amounts of food needed, and he felt the peasants would agree since the policy defended the revolution that brought them land. The war also forced a delay in what Lenin hoped would be the orderly collectivization of agriculture. Lenin saw collectivization as crucial to transform the peasants’ individualistic ideology and to modernize and mechanize agriculture. In December 1918, Lenin called for merging individual plots into large collective farms. But little collectivization actually took place over the next several years. Implementing collectivization at the time would have required tremendous effort by Lenin and the party – educating the peasants about its advantages, helping them carry it out, and following up on problems. But defeating the invasion required most of Lenin’s attention. Consequently the number of collective farms increased only slightly, from 3,100 in 1918 to 4,400 in 1920, accounting for just a fraction of agricultural production. The demands of the war also altered industrial development, which Lenin had hoped to develop in a balanced way. Because of the desperate need for workers in the war factories, Lenin supported an extreme policy known as the “militarization of labor,” which treated industrial workers essentially as soldiers. The government ordered a general mobilization of workers in April 1919, making labor in defense industries compulsory for everyone able to work. Wages were paid not in money but in food, clothing and limited quantities of household goods. Long hours were required, sometimes longer than those worked before the revolution. Lenin had not anticipated imposing such conditions after the revolution, but he saw very little alternative. After two-and-a-half long years, the efforts of the Russian people succeeded. The domestic reactionaries were defeated and the foreign troops driven from Russian soil. This historic victory over four global powers ensured the survival of the Soviet government, but it came at a high cost Russia’s efforts to build and modernize its socialist economy were sidetracked. Thousands of people, including many veteran party members, were killed. The lives of the working people were in many respects even worse than 1917. Capitalism can be utterly vanquished, and will be utterly vanquished by socialism creating a new and much higher productivity of labor. This is a very difficult matter and must take a long time; but it has been started, and that is the main thing. By the end of the imperialist intervention, Russia was in deep economic trouble. Industrial production was one-seventh the 1917 level and few consumer goods were being produced. Agricultural production was half the 1917 level. The peasants had little incentive to increase output since any extra food was taken by the government. Their standard of living was falling, as was their enthusiasm for socialism. In several regions, unrest among the peasants began flaring in late 1920. Lenin compared Russia to a man beaten within an inch of his life. The country had passed through seven years of almost continuous war. Lenin realized that “war communism” must be dismantled and replaced by policies to stimulate agriculture and industry, yield more consumer goods, and revive the flagging trade between urban and rural areas. Over several months, Lenin formulated a set of measures – collectively called the New Economic Policy (NEP). He introduced the NEP in March 1921 at the party’s Tenth Congress. The vastness of our agricultural country with its poor transport system, boundless expanses, varying climate, diverse farming conditions, etc., makes a certain freedom of exchange between local agriculture and local industry, on a local scale, inevitable. In this respect, we are very much to blame for having gone too far; we overdid the nationalization of industry and trade, clamping down on local exchange of commodities. Was that a mistake? It certainly was. Lenin saw agricultural collectivization as premature, given the devastation of the countryside. Collectivization required higher productivity and more equipment than existed at the time. Politically, the peasants were not yet ready for collectivization. For the most part they were reluctant to give up the individual plots they had so recently won. The NEP brought significant changes to industry. It placed a higher priority on light industry and consumer goods. Fuel and raw materials were allocated especially to these areas. Many small enterprises nationalized during the war were leased to individuals, who ran them and took responsibility for their profits or losses. Lenin held it was not efficient for the government to administer tens of thousands of small enterprises. Individual initiative could be utilized to revive production and trade without jeopardizing the socialist principle of public ownership of the means of production. Strict limits were placed on denationalization, and the largest and most important factories were still operated by the government. A government survey in 1923 showed that 88.5% of Russia’s industrial enterprises were privately owned or leased, but 84.5% of all industrial workers were employed in state-run factories. To modernize production, Lenin also called for wider use of “bourgeois experts’’ in industry. “Bourgeois experts” might not support the revolution, but had valuable scientific, technological or administrative skills. Lenin was careful to explain that utilizing such experts did not mean turning factories over to the bourgeoisie. Workers’ councils still guided production and oversaw the bourgeois experts. We must not be afraid of Communists ’learning’ from bourgeois experts, including merchants, petty capitalist co-operators and capitalists .... The re suits of the ’learning’ must be tested only by practical experience and by doing things better than the bourgeois experts at your side. Under the NEP, Lenin also opened the door to foreign economic investments on a selective basis. While this policy incurred costs, Lenin felt on balance it benefited socialist development. The capital invested invigorated the economy, and strict limits were placed on the profits foreign capitalists earned from these enterprises. The NEP was a drastic shift from “war communism” and generated substantial controversy. Lenin was sharply criticized by some Marxists, both in Russia and abroad. From the “left” came criticisms that Lenin was retreating into capitalism. They claimed that to build socialism, collectivization of production had to always advance to higher levels and individual production had to be steadily curtailed. They were shocked that Lenin was actually increasing the scope of individual production. Others’ criticism came from the right. They claimed the dire problems in Russia’s economy proved that constructing socialism in Russia was premature. Marx never talked about building socialism in such an economically backward country, they said. What was needed was a prolonged period of capitalism to develop the productive forces. After capitalism was fully developed, socialism could be considered. Lenin responded sharply to these critics of both “left” and right. He pointed out that neither side understood what was required to build socialism. Lenin told his “left” critics that they failed to realize that socialism could not exist without a qualitative modernization of the economy. Otherwise, Russia was doomed to being red and poor. The NEP was a retreat, said Lenin, but a temporary retreat carried out under the firm hand of the socialist government. Socialism could never be built through constant advances; retreats were sometimes necessary. If Russia’s economic problems were not solved, the people themselves would overthrow socialism. Addressing his critics from the right, Lenin pointed out that Russia’s economy would be most quickly modernized not under the rule of the capitalists, but under a socialist government. Under the bourgeoisie, there was tremendous waste as the capitalists diverted their profits into luxury goods, speculation and other activities of little benefit to the people. Under socialism, more resources could go into economic development. Lenin pointed out that his critics were actually pessimistic about the possibility of ever building socialism and were just looking for excuses to return to capitalism. The development of capitalism, controlled and regulated by the proletarian state i.e. ’state’ capitalism in this sense of the term), is advantageous and necessary in an extremely devastated and backward small-peasant country (within certain limits, of course), inasmuch as it is capable of hastening the immediate revival of peasant farming. Through intense struggle, Lenin won over the majority of the party and the people, and the NEP was adopted. Over the next several years, production dramatically increased. Food output climbed, and industrial production leapt from 35% of the 1912 level in 1921 to 54% the following year. As the economy improved, people’s enthusiasm for socialism grew. Lenin’s adoption of the NEP reflected his evolving view of socialism. He realized that while Russia’s political system was the most advanced in the world, its economic system was among the poorest. This problem was critical, since if socialism could not ultimately provide a higher standard of living than capitalism, why would people want socialism? If the Japanese scientist, in order to help mankind vanquish syphilis, had the patience to test six hundred and five preparations before he developed a six hundred and sixth which met definite requirements, then those who want to solve a more difficult problem, namely, to vanquish capitalism, must have the perseverance to try hundreds and thousands of new methods, means and weapons of struggle in order to elaborate the most suitable of them. Unfortunately, Lenin’s health began failing after a stroke in March 1922. Though he recovered, his work schedule was sharply curtailed. In March 1923, Lenin suffered a more serious stroke which ended his political career. He died in January 1924 at the age of 53. Socialism was very much in its infancy. The NEP was still in full swing and plans had not been formulated for ending it. The collectivization of agriculture had barely started. National economic planning hardly existed. Many problems still confronted the party. One can only conjecture how Lenin might have approached these problems as his views on socialism continued to develop. A critical problem that occupied much of Lenin’s attention during his last year of work was the problem of bureaucracy. Before the revolution, Lenin viewed the socialist state as inherently less bureaucratic than the capitalist state. The socialist state apparatus would be smaller and simpler than the capitalist state and would begin to “wither away” as soon as it was set up. As time went by, though, Lenin began to see the matter differently. The socialist state had vast responsibilities, including reorganizing and overseeing the national economy, developing and maintaining new political institutions, and ensuring that the overthrown exploiters did not return to power. These tasks were complex and generated a tendency towards spontaneous growth of the government machinery. The Soviet state apparatus grew steadily larger, with a proliferation of agencies and institutions. As time went by, Lenin increasingly saw danger in this trend. He felt the Soviet government was losing touch with the people, and he stressed the need for the government to be controlled from below. Our state apparatus is so deplorable, not to say wretched, that we must first think very carefully how to combat its defects .... We must reduce our state apparatus to the utmost degree of economy. We must banish from it all traces of extravagance, of which so much has been left over from tsarist Russia, from its bureaucratic capitalist state machine. Unfortunately, Lenin died in 1924 and was unable to follow through on this problem. The fact that the struggle against bureaucracy was not pursued later led to serious problems for the Soviet Union. What can we say about Lenin’s view of this new social system? On the most basic level, Lenin saw socialism as a society dedicated to the interests of the working people, who make up the vast majority of the population. The basic means by which society produces its wealth – factories, mines and farms – are transferred from private to public ownership, and exploitation is for the most part eliminated. Socialism unleashes the creativity of the common people, who are capable of tremendous advances when not laboring under a system of exploitation. Lenin held that capitalism could not be eliminated and socialism fully established at one stroke. It took time to phase out the old capitalist machinery, set up new economic and political institutions, and remold people’s way of thinking. Lenin believed that socialism would eventually replace capitalism worldwide because it would prove economically superior and would provide a better quality of life for its people. Realizing socialism’s potential for economic progress required flexibility and innovation. While Lenin upheld the basic Marxist tenets of social ownership of the means of production and “to each according to his work,” he utilized a variety of methods. As for what socialism in the U.S. will look like, no one can predict exactly. Socialism has never been built in a country like this. We will face very different problems than those Lenin confronted in 1917, and we do not aim to copy the example of Russia under Lenin. Socialists in the U.S. cannot take the approach of seeking a model in another country. The form socialism takes here will inevitably be shaped by this country’s particular conditions, including the highly developed capitalist economy, long history of bourgeois democracy, multinational population, vast geographical resources and particular cultural heritage. While it would be impossible to describe exactly what this new social system will look like, it will be a positive new era in which the insecurity, oppression, and injustice characteristic of the U.S. today will be eliminated, and the potential for a better life and social progress can be realized. Richard Fleming is an editor of Forward. When Lenin talked about ending “exploitation,” he meant the process of capitalists not paying workers the full value of what they produce. The capitalists withhold as profits part of the wealth that workers produce, a process called “exploitation.” The “dictatorship of the proletariat” refers to the nature of government under socialism, in which the working people hold state power. They operate the government in the interests of the overwhelming majority of society and ensure that the overthrown capitalists do not return to power. It should be noted that Lenin never gave a single precise definition of socialism in any one article. The features mentioned are derived from several of Lenin’s writings, including “Karl Marx,” “Tasks of the Proletariat in our Revolution” and State and Revolution. “Left-Wing Childishness and the Petty-Bourgeois Mentality,” May 1918. At different times, Lenin used different phrases to describe the socialist government, including “dictatorship of the proletariat” and “dictatorship of the proletariat and poor peasants.” In his “Address to the First Congress of the Communist International” in 1919, Lenin said: “The substance of Soviet government is that the permanent and only foundation of state power, the entire machinery of state, is the mass-scale organization of the classes oppressed by capitalism, i.e., the workers and the semi-proletarians (peasants who do not exploit the labor of others and regularly resort to the sale of at least part of their own labor-power).” The main point is not the exact phrase Lenin used at any given time, but his conception of the socialist government. It is clear Lenin saw the poor peasants making up an integral part of the government. “Can the Bolsheviks Retain State Power?” September 1917. “Address to the First Congress of the Communist International,” 1919. “A Great Beginning,” June 1919. “Left-Wing Childishness and the Petty-Bourgeois Mentality,” emphasis added. By “state capitalism” Lenin meant a system where capitalist economy predominated and where the government, or state, administered the key sectors of the economy. See E.H. Carr, The Bolshevik Revolution, Vol. 2, Penguin Books, 1952, p. 159. Carr, Bolshevik Revolution, p. 302. “The Tax in Kind,” April 1921.